Estelite Sigma Quick is a supra-nano filled, low-shrinkage composite indicated for anterior and posterior class I-V restorations. Estelite Sigma Quick implements RAP technology (Radical-Amplified Photopolymerization initiator technology), which offers increased working time of 90 seconds under ambient light and decreases the curing time to 10 seconds with a halogen light. Estelite Sigma Quick is available in both syringes and pre-loaded tips (PLTs) in shades: A1, A2, A3, A3.5, A4, B1, B2, B3, B4, C1, C2, C3, OA1, OA2, OA3, OPA2 (opalescent), BW (bleach white), WE (white enamel), and CE (clear enamel). This product received a 99% clinical rating. 1836 Estelite Sigma Quick restorations were placed using a wide variety of 6th– and 7th-generation bonding agents. 353 restorations (molars – 47%, premolars – 27%, anterior teeth – 26%) in 163 patients were available for evaluation of clinical performance up to 24 months after placement. The distribution of restorations is shown in Figure 1. 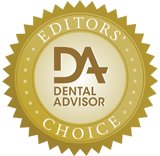 Restorations were evaluated on a 1-5 rating scale: 1 = poor, 2 = fair, 3 = good, 4 = very good, 5 = excellent. Figure 1. 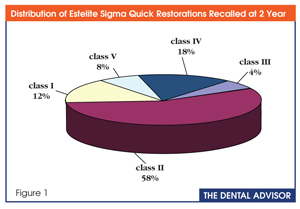 Distribution of Estelite Sigma Quick Restorations. Estelite Sigma Quick performed very well after two years in service (Figure 2). Eleven restoration exhibited slight chipping and none requiring replacement. There were seven debonds during the two years since placement. All of the debonds were facial/buccal restorations. Estelite Sigma Quick exhibited very good esthetics both in the anterior and posterior regions after two years in service (Figure 2). The rapid cure time and excellent viscosity facilitated placement of the resin composite in all areas of the mouth. The excellent esthetics was a result of a variety of shade availability and the cameleon effect of the material. All of the Estelite Sigma Quick restorations were placed using self-etching bonding agents. Ninety-eight percent of the restorations had no marginal discoloration after two years (Figure 2). Estelite Sigma Quick maintained excellent wear resistance both in the anterior and posterior regions after two years in service (Figure 2). Figure 2. Results of Estelite Sigma Quick Recall at Two Years. 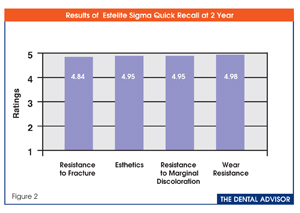 Three hundred fifty-three Estelite Sigma Quick restorations in 163 patients were available for recall up to two years after placement. A 2% debond rate and excellent resistance to marginal discoloration were observed when the resin composite was used with a wide variety of self-etching bonding systems. 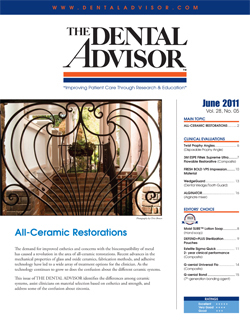 At two-year recall, the majority of restorations exhibited excellent resistance to chipping and very good esthetics.